It was not until early 1943 that Factory No. 183 chief designer Aleksandr Morozov got the authorities in Moscow to sign off on his being the chief designer for all T-34s produced by all other factories. The reason he wanted this control was to ensure commonality of production and standardization of parts among all of the tanks. Up until that time the factories were provided with the Factory No. 183 plans but made local changes as they saw fit. Factory No. 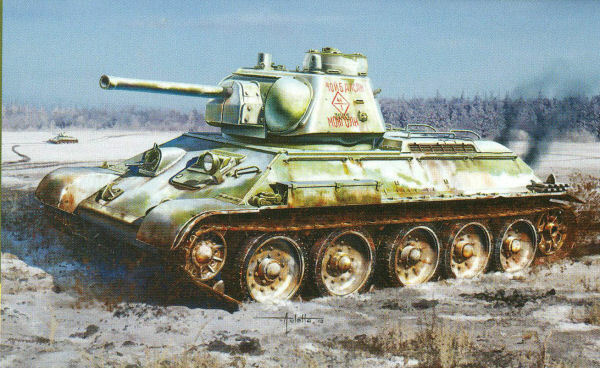 112 - “Krasnoye Sormovo” – was no different, and in point of fact produced the early model T-34 with the small turret until mid 1943 as a result. Once the factories standardized, they upgraded their production to use the larger “Gayka” six-sided cast turret. Other changes were introduced as they went along. The Factory No. 112 tanks had a so-called “Sharp Edge” turret with many small casting fillets under the swell of the turret, as well as the interlocking hull design used by “Krasnoye Sormovo” from the beginning. As features were added, they applied them, with the result they quickly added the commander’s cupola. When the restriction on using cast road wheels with internal buffers – hated as they made the tanks noisy and fatigued the crew – they adopted first the cast wheels and later the solid disk wheels more commonly seen on T-34-85 tanks. DML’s latest effort is supposed to replicate the very late production Factory No. 112 76mm tanks, but it does not use the better known turret associated with this factory. It does have the interlocking hull and profusion of “tankovyy desant” handrails for tank riders, as well as the very late production solid disk road wheels and rubber tires. It also uses the same turret casting numbers on both of the finishing options (found just forward of the pistol ports on Factory No. 112 turrets) which does not make sense. The rest of the parts are “mix and match” sprues from DML as most modelers who have built many kits are familiar with as a rule. As T-34s did not vary that much, this is not a bad thing and in most cases the parts are fine. It comes with several glacis plates (P1 is the “winner”) and stern plates too (P21 here). Three alternative engine decking grilles are provided with P18 being the solid one and P19 the one to use with the provided etched brass parts. Note as with all DML engine grilles the louver mounting plate (MA1) will interfere with their fit on the rear of the hull so care must be taken to get it to fit correctly (e.g. trim the edges of the mounting plate back a couple of millimeters if you are not leaving the cover open). The kit is shown offering either the rounded bow for the glacis (P27) or the sharp-edged one (C3) which was introduced for T-34-85 production. Remember these are very late production tanks (e.g. November 1943 and later) and may well have had the new bow installed. Most of the rest of the model is pretty straightforward. It comes with “Magic Track” two-section tracks (plate and tooth) so requires getting the geometry straight when installing the tracks (e.g. leave the idler wheel mounts loose until fitting the tracks at the end to ensure the right number of links and the right amount of “slop” are used). Technical assistance was provided by Nick Cortese, Tom Cockle, and Gary Edmundson. Two finishing options are offered: Unidentified Unit, Germany 1943/44 (red 44-1, “Choybalsan Mongoln”, whitewash over 4BO green); and Unidentified Unit, Voronezh Front 1942/1943 (green heart with white drop, whitewash over 4BO green). Neither option makes any sense for a true Factory No. 112 “Gayka” tank with cupola unless the first one was captured and the second one was misidentified. Overall, this is a nice kit but has a number of problem areas in its “pedigree”.